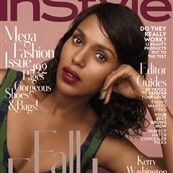 The last time we talked about Kerry Washington on a magazine cover, it was because they f-cked up her face, yet again. This time, for InStyle’s September issue, it actually looks like Kerry Washington on the cover of a magazine so instead of obsessing over her skin tone or her features, we’re paying attention to her words. Kerry is using her words to address an important issue when it comes to diversity. Hey, it’s that word everyone hates: Diversity! Since that word became the go-to topic of conversation in Hollywood, a lot of actors have said a lot of things on the issue. Kerry’s latest take may just be the one Hollywood needs to hear the most. "Being the one woman in the room should not be seen as a victory. If there’s only one of us in the room, we’re still a token; we don’t actually have an empowered voice. If there’s two of us, we’re still a minority. If there’s three… then we’re allowed to have a multiplicity of opinions." THIS. Hiring one black dude doesn’t mean you’ve fulfilled your “diversity” duties. Toting out that sole female hire as proof that your company isn’t full of sexist dickheads doesn’t mean that your company isn’t still full of sexist dickheads. The standout from Kerry’s quote is the line “then we’re allowed to have a multiplicity of opinions.” Sometimes, being the “token” in the room means you have to speak on behalf of your entire race. Not only is that a frustrating burden, it also limits the “multiplicity of opinions” you can offer up. Recently, a friend of mine was struggling with whether or not to speak up about a race issue at work because he/she is the only minority in their position. They were worried about ostracizing themselves from their coworkers and becoming an outsider to their boss if they spoke up about the issue. Those fears of isolation would probably not be there if my friend was not a token. Diversity starts with one hire but it should not stop there. Kerry also talks about growing up as the token black girl at the prestigious Gwyneth-attended all-girls school, Spence. "From the time I was 11 or 12, everyone [at school] was like, 'You are so lucky to be here.' And I was lucky, but so were they…They were lucky I was there because I gave them an expanded idea of what humanity looks like, feels like, and how it expresses itself." I also went to a predominately white private school when I was 11 or 12. The thought that I may have given my classmates “an expanded idea of what humanity looks like” never crossed my mind. Kerry is not wrong though. Our views are expanded and shaped by the people we encounter and the life experiences they can share with us that differ from our own. God, she’s so smart. I wish this interview was around for me to read when I was just a token kid trying to blend in at the back of the classroom. That, and Simone Biles. I wish Simone Biles was around back then too.